She had traveled to Alabama all the way from California to be here for this moment. She had managed to stay dry in a torrential downpour that would have forced many others away. Had somehow beat the odds, got in line early, and secured one of the sold-out opening day tickets for access to The Legacy Museum. So it was a surprise to Isoke Femi that the hardest thing for her to manage were the words to describe what she had just witnessed. “My experience in there… is so painful,” she said exiting the exhibit. The Legacy Museum: From Enslavement to Mass Incarceration opened April 26, 2018, in Montgomery, Alabama, and is filled with visual exhibits to help visitors understand what many blacks in the United States have historically endured. Built on the site of a slave warehouse in downtown Montgomery, once the epicenter of the slave trade in the United States, in a town that at one time was the capital of the Confederacy, The Legacy Museum: From Enslavement to Mass Incarceration is filled with visual exhibits that serve as a catalyst for understanding what many blacks in the United States have historically endured. “Five-thousand blacks were lynched between 1880 and 1940,” said civil rights leader the Rev. Jesse Jackson, who was an early supporter of the museum and the nearby National Memorial for Peace and Justice, a new memorial that sits on a grassy, six-acre hill overlooking Montgomery. It is the first memorial and museum of its kind in the United States, tackling subjects such as racial terrorism and lynching. 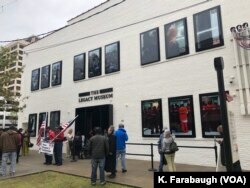 Founded by the Equal Justice Initiative, a nonprofit organization working in marginalized and impoverished communities, the group hopes the Memorial and The Legacy Museum will help change the national narrative about race. 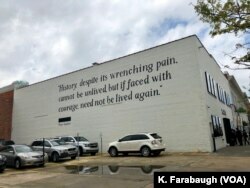 The Legacy Museum, which opened April 26, 2018, at the site of a slave warehouse in Montgomery, Alabama, has written on one side of the museum a Maya Angelou quote. But not a post-racial society, says Mark Potok, former senior fellow with the Southern Poverty Law Center, who spent much of his career tracking hate groups in the United States. “It is white people in this country, and in the South in particular, who are so averse to facing the past squarely,” he said. Potok says racism and bigotry, particularly in Alabama, which now hosts this museum and memorial, are not yet consigned to the history books. “It’s worth remembering that 15 years ago, a very short time ago, the majority of white people in Alabama voted to keep segregated schools in the state constitution,” Potok said. Jackson says it’s not just Alabama. “And even today … 200 attempts to get federal anti-lynching legislation has not passed,” he said. The biggest barrier in Jackson’s mind today is the one keeping people from the ballot box. “There are 4 million blacks in the South unregistered to vote,” he said. Mark Potok agrees with Jackson, and believes the best way to bridge the racial divide in the United States is to vote. Isoke Femi, still reeling from her walk through the images and displays that deal with powerful and uncomfortable truths long avoided, sees hope in the crowds around her. In that healing, Jesse Jackson hopes there is also a lesson.